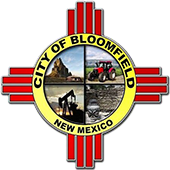 The City of Bloomfield, New Mexico - How Do I? How do I rent the pool? You may rent the entire pool for your party or event. The indoor pool is available for rental from 7-9 p.m. on Fridays and from 5-7 p.m. on Saturdays. The $150 rental fee includes staff and lifeguards. A deposit must be made when the reservation is booked. For more information, call 505-632-0313. How do I see what is on the Council Meeting agenda? There are several notaries at City Hall and any of them will be more than happy to help. There is no fee to have papers notarized at City Hall. Information for municipal elections is posted on the City Clerk page. Municipal elections are held every two years. The next municipal election in Bloomfield will be held in March, 2018. For county, state and federal elections, you may go to the County Clerks page of the San Juan County website. How do I pay for my Municipal Court Citation? Defendants must be dressed appropriately in order to be admitted into the courtroom. Where do I look for job openings? Where do I find a City application? How will I be contacted after I have turned in my application for employment? You will be required to enter your e-mail address when you apply for a job. You will be notified by e-mail on you status. If you are selected to be interviewed, you will be contacted by an HR representative and given the date and time of your interview. You may call 505-632-8448 during regular business hours -- 7 a.m.-5:30 p.m. -- or complete a form that is available online. How is my property zoned in Bloomfield? It depends on the location in Bloomfield. Most of the zoning in Bloomfield is Agricultural, Community Commercial, Heavy Industrial, Light Industrial, Neighborhood Commercial, Residential (R-1), Residential (R-2), Residential (R-3), Residential (R-4), Rural Residential (RR-1), and Planned Unit Development District. How do I get a fence permit? The property owner must complete a Building and Zoning Compliance Application/Permit. The front and side yard height limit is four feet. The back yard height limit is six feet. An illustration of the fence heights is available. If you're unsure about your property line, please have a surveyor set those property lines for you. There is no charge for a fence permit. Where do I get a storage shed permit? The property owner must complete a Building and Zoning Compliance Application/Permit. The setbacks for the shed will be determined by how the property is zoned. A copy of the site plan will be required. There are no fees for a storage shed permit. Where do I get a carport/garage permit? The property owner must complete a Building and Zoning Compliance Application/Permit. How the property is zoned will determine setbacks for the carport/garage. A copy of the site plan for the carport/garage is required. Because a carport and a garage have roofs, a building permit is also required by San Juan County. Ken Douglass is the building official and he may be reached at 505-334-4313. There is no charge for a carport/garage permit. Do I need a permit to move a mobile home to Bloomfield? Any mobile home being moved to Bloomfield requires a Mobile Home Movers/Set Application. The application must be completed by the owner of the mobile home or the contractor moving the mobile home. The contractor must have a City of Bloomfield business license. There is a $25 fee assessed for every mobile home. Do I need a permit for a new sign for my business? Yes. A Sign Application/Permit must be completed by the property owner. One dollar per square foot of the sign must be paid. The business putting up the sign must have a City of Bloomfield business license. All pole signs require an engineer's stamp and have a building permit from San Juan County. Contact Ken Douglas at 505-334-4313. What is the procedure to get a right-of-way/excavation permit? The contractor must have a City of Bloomfield business license and complete an Excavation Permit application. The application will be issued based on if the property is near a paved street or dirt street. A $25 inspection/admin fee is charged and is non-refundable. For a paved road, an additional fee of a $5,000 bond or a $1,500 cash depost will be charged. For an unpaved road, the fee will be $2,000 bond or $175 cash deposit. What paperwork is required for an address verification to connect my utilities? An Address Verification Form must be completed and provided to City Hall, along with proof of ownership of the property or rental/lease agreement of property. What is on the menu for today? The monthly menu is posted on the website or you may pick up a copy of the menu at the Senior Center. The bulletin board at the Senior Center is the best place to see what activities and classes are scheduled. Menus and activities are also included in Bits & Pieces, the city's newsletter, which goes out with utility bills each month. For more information, call the Senior Center at 505-632-8351. All new clients who would like to participate in the meal and transportation programs at the Senior Center need to complete paperwork. Jessica Pollaty, the center's director, will assist you. There are no membership fees or dues associated with the Senior Center and lunch is strictly a voluntary donation. Garage/yard sale permits may be obtained at the Bloomfield Utility Department at Bloomfield City Hall, 915 N. First Street. Permits are $5 each and residents may hold a garage/yard sale only three times each year. Garage/yard sale signs are also available in the Utility Department for 50 cents. Where do I go to get a membership to the fitness center? All memberships are paid for and processed at City Hall at 915 N. First Street from 7:00 a.m. to 5:30 p.m. Monday thru Thursday. City Hall is closed on Friday. Where can I find a copy of the Fitness Center Flyer? How do I rent a room at the Cultural Center? You will need to fill out the Cultural Center Rental Contract and bring it to City Hall at 915 N. First Street anytime between 7:00 a.m. and 5:30 p.m. Monday thru Thursday. Please read the terms and condition of the contract before you fill it out. All payments for your rental are made a City Hall. Do you take Credit Cards and Debit Cards or just cash and checks? The City will accept cash, personel checks, and credit and debit cards. We accept Visa, MasterCard, Discover and American Express.